See the full panel discussion here! The cod moratorium is a story many of us are familiar with, a tragedy that resulted from fishing pressure exceeding what a stock could sustain. The collapse left lasting impacts on the marine ecosystem and also the fishing-dependent coastal communities of Newfoundland and Labrador. Today, nearly 25 years after the moratorium, the story is changing from one of despair to optimism as the cod stocks show sign of recovery, thus providing a unique opportunity to envision a fishery for the future. 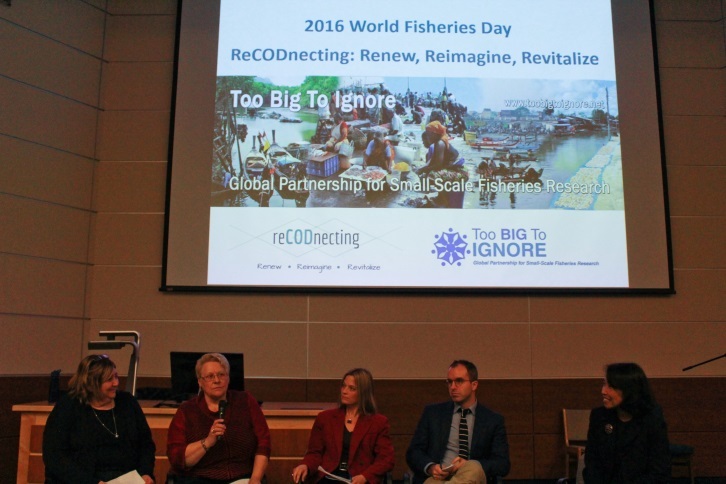 November 21st was World Fisheries Day, and Too Big To Ignore hosted 'ReCODnecting' at Memorial University, an event aimed to explore ways to renew, reimagine, and revitalize the cod fishery of the future. The finalists of the fishcake cooking competition. From right to left: Delphine Rocklin, Leo Hearn, and Mirella Leis (Winner). ReCODnecting was a celebration of fisheries in the province and a time to discuss and reflect on the future of our fisheries. 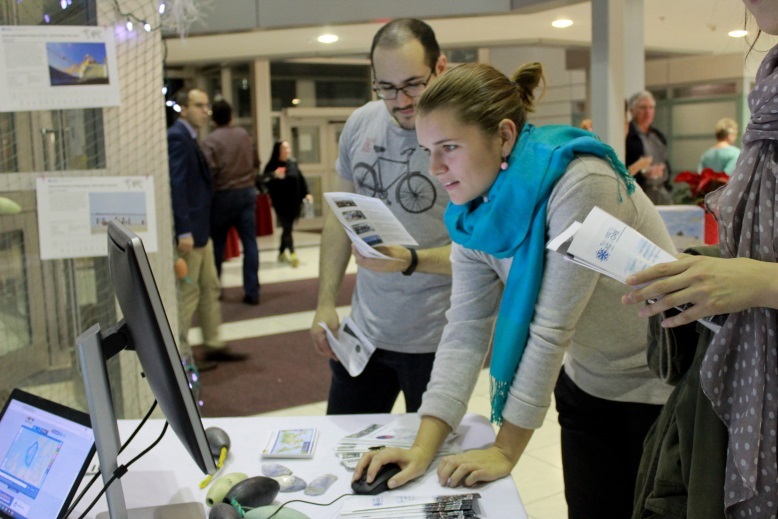 The first part of the event showcased interactive displays from a range of organizations and researchers. This was followed by the Great Fishcake Recipe Challenge, which had been promoted leading up to the event, seeking recipes for the best fishcake. 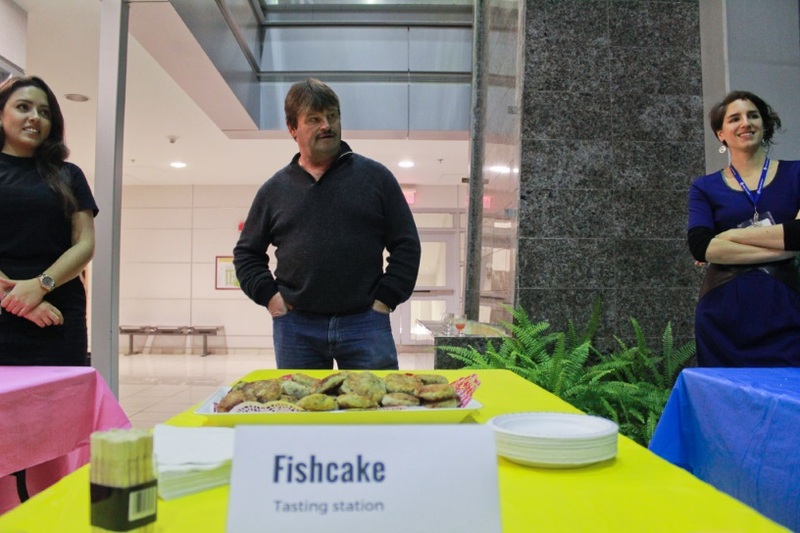 Three recipes were selected and prepared for the event, where participants tasted and voted on the best fishcake. 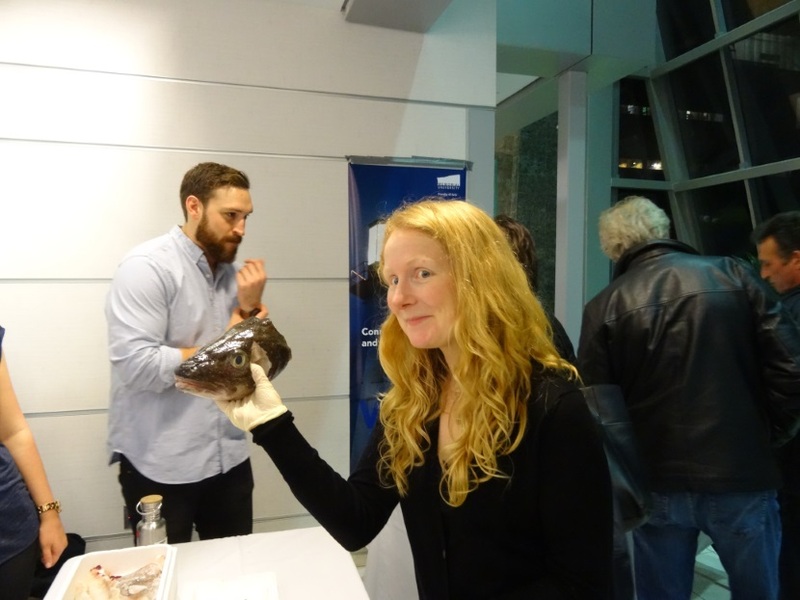 The diversity of the recipes and enthusiasm from participants was an indication of the increased role fish could have in our diets, and the endless opportunities for innovative cuisine. The second half of the event involved short presentations and a panel discussion on the future of the fishery. This highlighted the contributions a sustainable and renewed cod fishery could offer to the social, economic and cultural dimensions of our province, but also cautioned that to achieve this, we must learn from the mistakes that lead to the collapse of the fishery and do things differently. David Bishop shows guests how to navigate through ISSF. Coinciding with the theme of the event, panelists explored ideas around renewing, reimagining and revitalizing the fishery. A selection of comments under each of these themes is provided below. Guests exploring our Information System on Small-Scale Fisheries. RENEWING our connection to the cod fishery: Panelists emphasized the importance of taking pride in the fishery. This includes celebrating the link between fisheries and identity in the province; recognizing its importance for employment, food, culture, and tourism; viewing it as a viable employment pursuit, encouraging and providing youth with hands-on experience in fisheries; and also eating more local fish. 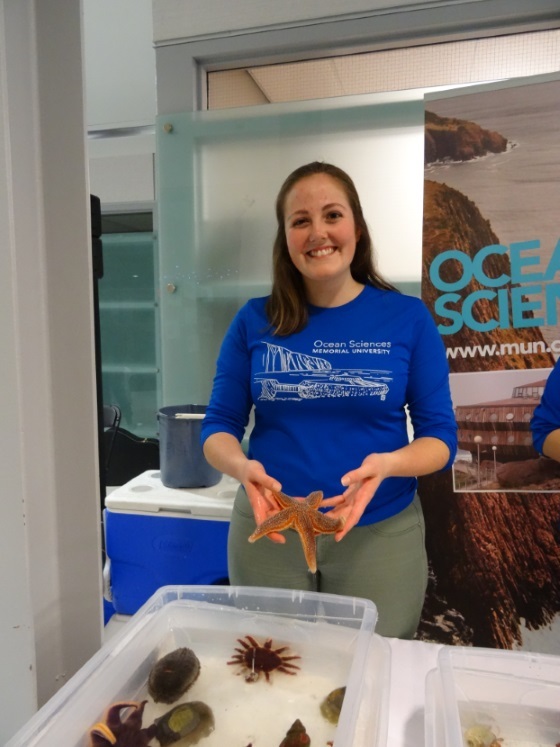 Ocean Science Centre/Ocean Learning Partnership with their touch tank. REIMAGINING a new fishery: Panelists alerted that we must focus on value not volume of fish harvested, and to place efforts on harvesting quality fish. In particular, the small-boat fishery was noted as having a unique advantage to utilize selective gears and handing procedures conducive to yielding high quality fish. Panelists also acknowledged that the economic value of fish could be further enhanced by shifting to full utilization model, as has been done in Iceland, whereby all parts of the fish are used. This would not only result in less waste and increase the value of each fish, but could also lead to an increased focus on innovation in processing technologies, harvesting methods, culinary exploration, social enterprise, and more. Panelists also discussed opportunities for improved synergy between tourism and fisheries, by encouraging decision makers to reimagine the fishery in a way that can help sustain our rural regions through a stronger connection to sustainable tourism. ReCODnecting Panelists. From right to left: Blane Edwards, Kelly Vodden, Carolyn Lavers and Edith Samson. REVITALIZING Our Fishery and Communities: Panelists suggested a range of possibilities for revitalizing our fisheries. Inclusive forums and a shift towards more participatory fisheries governance were raised as important mechanisms to discuss the fishery, generate ideas for new ways forward, and improve transparency. The importance of including and promoting fisheries in rural and regional development strategies was also noted, as well as providing more teaching and learning opportunities in fisheries for both primary and post-secondary education. Increasing seafood consumption was seen as an important (and tasty) way to revitalize the fishery in the province, and was noted as being low in comparison to other jurisdictions. Panelists mentioned tremendous opportunity for increasing the consumption of local seafood in the province and elsewhere in Canada, and also highlighted the health benefits this could offer. The Abbie Table. 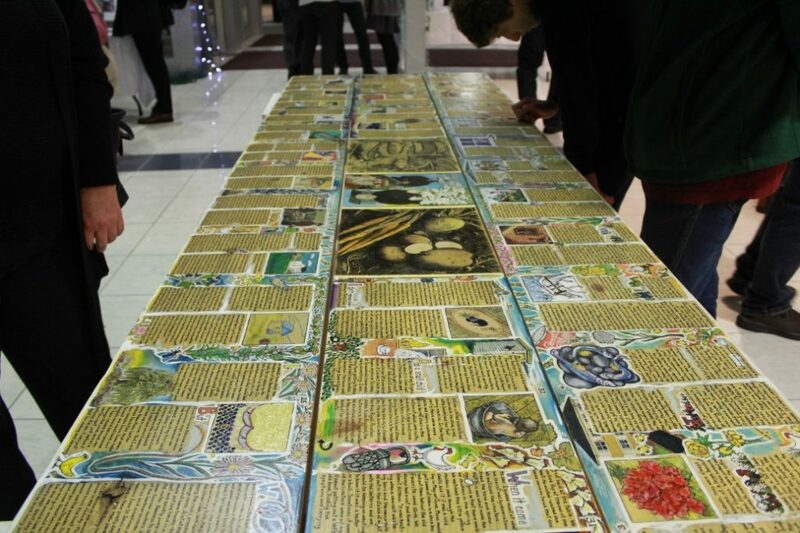 Created by Andy Jones to commemorate the life of Abbie Whiffen. 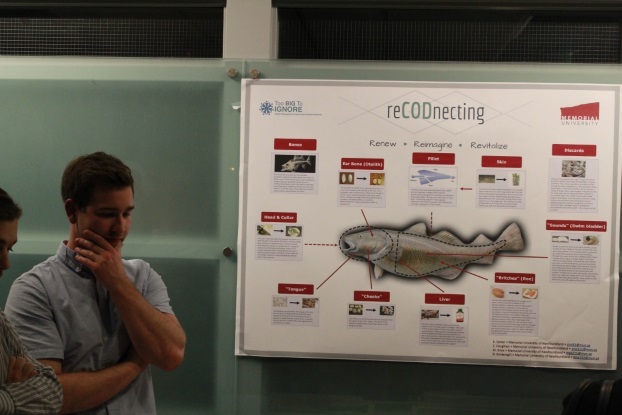 Students at Memorial University break down the value of the cod fish and promote less wastage. 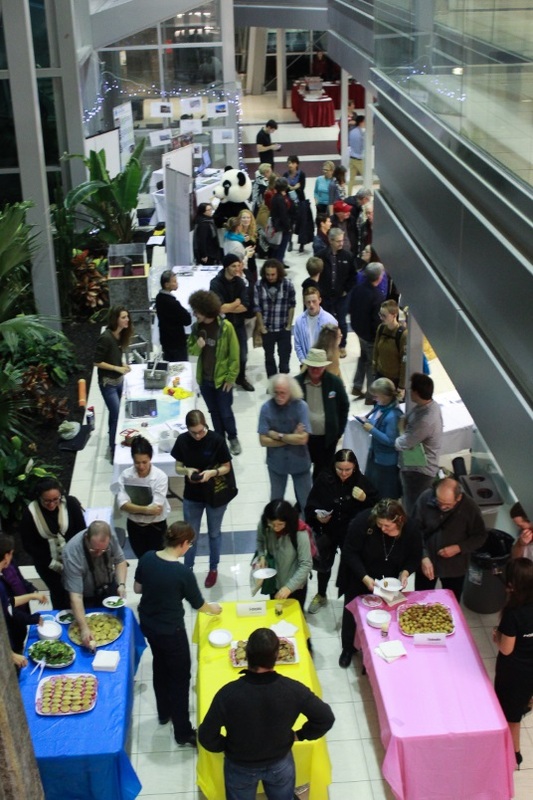 This World Fisheries Day celebration brought together over 100 participants interested in and committed to supporting sustainable fisheries in the province. 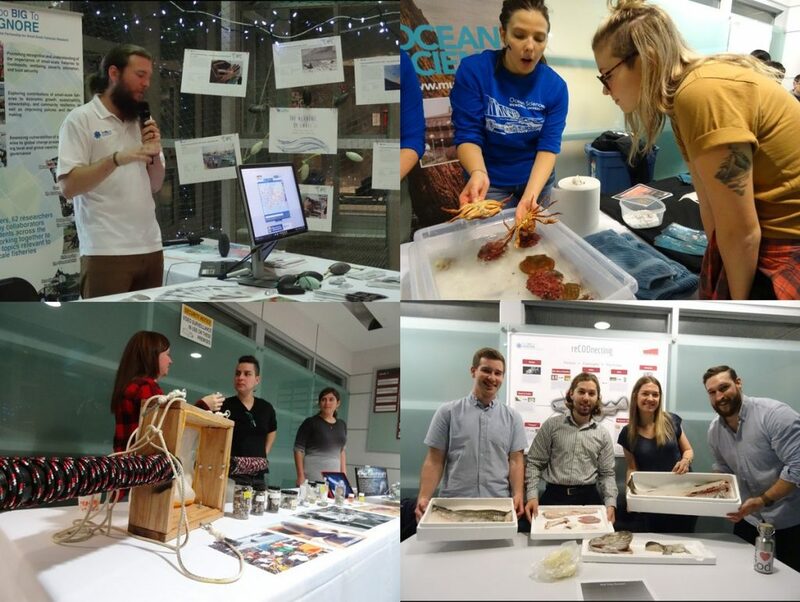 The event showcased leading research and initiatives happening to improve fisheries, but also emphasized the need for more innovation and action to renew a fishery of the future. 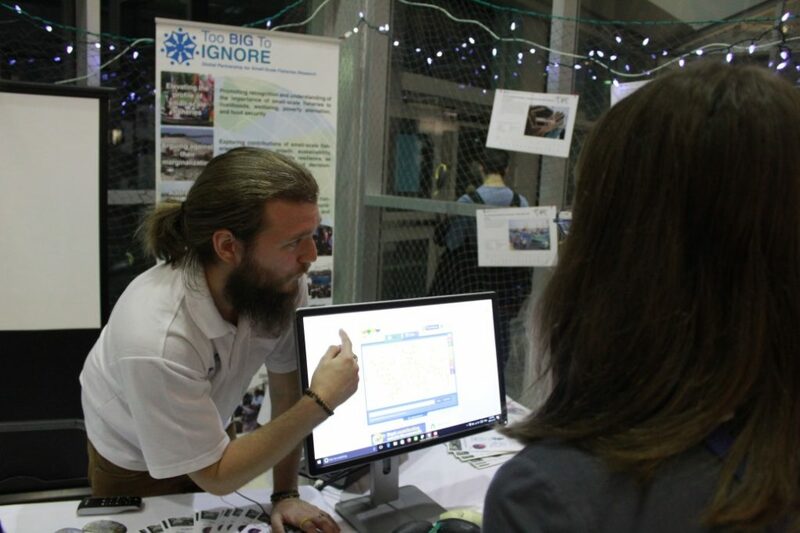 A video was developed and presented at the event by graduate students in a Conservation and Sustainable Resource Management course, and in it they left participants with a statement that should guide all efforts in advancing fisheries in the province, this was "wouldn't it be nice if Newfoundland and Labrador was known for having the most sustainable fishery in the world?" Let us keep this at the forefront of our work as we renew, reimagine and revitalize our fishery.